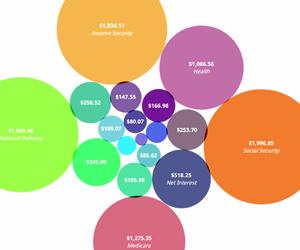 To introduce you to the API, we've created an example visualization in HTML5. Feel free to reuse the source code as you wish. What does a great visualization look like? We're excited that the web is making it easier than ever to create interactive data visualizations, and we're hoping that this challenge will produce some great interactive pieces. That's why we've provided the API. However, before you start adding all the interaction you can imagine, think about what meaning an interaction brings to the piece and how best to convey that meaning.